Ms. Natasha McArthur is a single mom of two sons, I’Mearh and Maurice, ages 6 and 3, respectively. When Ms. McArthur first came to Tri County Community Action (TCCA) in 2009, she was living in a shelter and needed permanent housing. A friend told her about TCCA, and she worked with its Family Self Sufficiency Case Managers but decided to move to NY. She returned to PA in November 2010. Ms. McArthur struggled to get herself re-established in the area and was only able to support her family through short term positions and DPW assistance. Still struggling, she contacted Harrisburg Area Community College (HACC) in 2012 and began an Associate’s degree program in Human Services. Support from DPW helped pay for her tuition, but she was required to volunteer 20 hours a week in order to keep going. Because of her contact with TCCA in the past, she called their office and asked if she could volunteer there. Not wanting to lose the opportunity, in addition to volunteering she was also connected to both their Family Center and Family Self Sufficiency Case Management programs. Both programs helped her set goals, ensure her children were on track, and stay focused on moving towards self-sufficiency. She volunteered at the agency for over 1.5 years, working in a variety of programs while learning professional skills. In 2014, she applied for an entry level position within the agency and, because of her professional and personal growth, was offered the position. 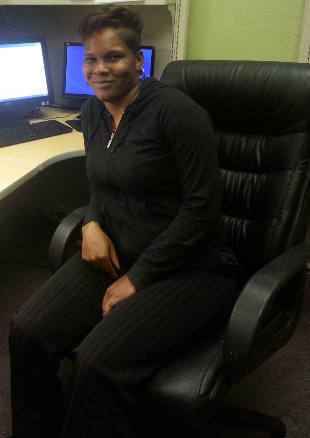 Ms. McArthur is now an Energy Assistance Specialist with TCCA and continues her education at HACC. Ms. McArthur’s initial goals were related to housing but grew to include getting her Associate’s degree, securing professional full-time employment, and purchasing her own car. Transportation had been a significant issue, but Ms. McArthur now has a driver’s license and has purchased her own vehicle. Obtaining stable housing was also difficult, but she now lives in subsidized housing.